The Olympic torch for the upcoming Winter Games in Sochi, Russia has made quite the journey so far. It’s only a little over a month into its 123-day, 65,000 kilometer relay, but already, the torch has made it to the frigid north and even outer space. This past week, cosmonauts carried the torch during the spacewalk, a first for the Olympic record books. And on October 19, the Olympic flame reached the North Pole after a record-breaking 91-hour trip aboard the nuclear icebreaker, 50 Let Pobedy, from Murmansk, Russia. Lifting the Olympic flame above the North Pole, Russia seemed to be saying, “We are the world.” But that “we” was an exclusive one. With eight national flags waving in the polar wind, the circle made around the North Pole was essentially state-based. National governments, not indigenous peoples or non-Arctic states, hoisted the flags. Russia Today reports, “Torch bearers were selected from the eight member countries of the Arctic Council – Russia, Norway, Finland, Sweden, Canada, the US, Iceland and Denmark – to symbolize international unity in the region,” though the flag of Greenland and indigenous peoples’ organizations like RAIPON was nowhere to be seen. RAIPON’s flag: nowhere to be seen. A list of the 11 torchbearers who joined in the Olympic moment at 90° North illustrates the outsize weight of the Arctic Council, scientists, and academics in Russia’s imagining of the Arctic compared to indigenous peoples, who were not at all represented during the ceremony. 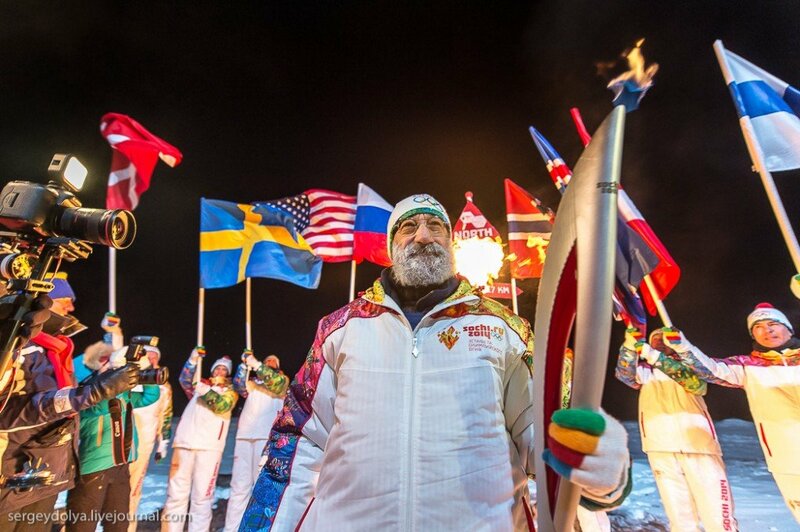 Even the official Olympics press release says that the torchbearers who supported Chilingarov were those who have “contribute to the conservation of its natural resources, animals and ecology” – and not its peoples or cultures. Given that President Vladimir Putin ordered RAIPON temporarily closed this time last year, the absence of representatives from any of Russia’s numerous indigenous groups such as the Nenets or Sami comes as no surprise. Had Canada orchestrated this event, it’s likely that indigenous peoples would have had a much stronger showing. Alas, even if Canada hosted the Winter Olympics, it would not be able to carry the torch up to the North Pole. Russia’s speedy and showy relay leg to the top of the world showcases its Arctic prowess. No other country has a nuclear icebreaker, so no other Olympic host could have powered to the North Pole in fewer than four days. Last week, while England shut down its last remaining shipyard, Russia began construction on what will be the country’s – and thus the world’s – largest nuclear icebreaker. Rosatom, the state-owned operator of 50 Let Pobedy, sponsored the North Pole jaunt, underscoring the significance of national capabilities even in an event as internationally symbolic as the Olympic torch relay. By carrying the Olympic torch to Sochi via the North Pole, the bottom of Lake Baikal, and outer space, Russia is attempting to reinscribe its capabilities for time immemorial under the veil of the feel-good Olympic spirit. Trying not to look over their shoulders, torchbearers announce to the world that Russia was, is, and will be a world power.